Hundreds Attend Vigil for 4 Men Found Slain in Pa.
NBC10's Pamela Osborne shares the latest from Bucks County where counselors helped people impacted by the killing of four young men at a farm. Family, friends and community members in Pennsylvania gathered for a vigil to remember the slain four young men whose bodies were found on a sprawling 90-acre Solebury Township farm. The Sunday night vigil at the Garden of Reflection 9/11 Memorial in Lower Makefield Township and included prayers, music and the lighting of candles. Matthew Schuler, a former contestant on NBC's "The Voice'' and a Bucks County native, sang the song "Hallelujah." The event honored Jimi Taro Patrick, 19, of Newtown Township; Dean Finocchiaro, 19, of Middletown Township; Mark Sturgis, 22, of Pennsburg, Montgomery County; and Tom Meo, 21, of Plumstead Township. "In light of recent tragic events in our County, it is more important than ever that we gather to reflect and remember that we are a community and together we are strong," an organizer for the event wrote. Patrick's grandparents released a statement thanking authorities who took part in the search as well as the parents of the victims. "These parents gave us the strength and resolve to persevere and accept the fact that the victims were no longer with us," they wrote. "We, as a group, made the decision to forgo the death penalty for the defendant in return for locating our grandson." Friends of Meo's also created a GoFundMe page to help with his family's funeral expenses. And, Neshaminy High School opened its doors Monday so that people dealing with the death of graduate Finocchiaro and the other young men could talk to counselors. A preliminary hearing for the suspects, meanwhile, is scheduled for July 31. Suspects Cosmo DiNardo and Sean Michael Kratz, both 20, will face District Judge Maggie Snow at Bucks County Courthouse in Doylestown. 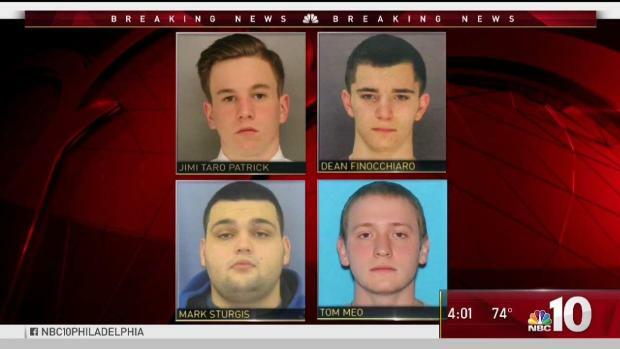 Authorities on Friday filed charges against Cosmo DiNardo and Sean Michael Kratz that include four counts of criminal homicide against DiNardo and three counts of criminal homicide against Kratz. DiNardo, of Bensalem, also is charged with 20 other counts, including conspiracy, robbery and abuse of a corpse, according to court documents. Kratz, of Northeast Philadelphia, also faces 17 other counts of the same charges. 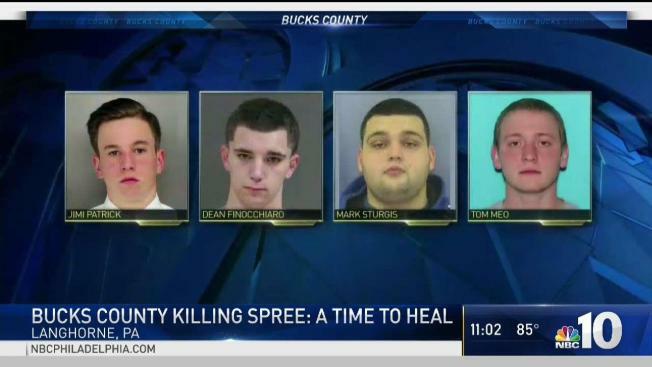 "I feel a lot of sadness," Bucks County District Attorney Matthew Weintraub said while announcing the charges Friday. "I feel relief. I feel so proud of my team, and I feel resolve. We have so much more to do to bring justice to this case." 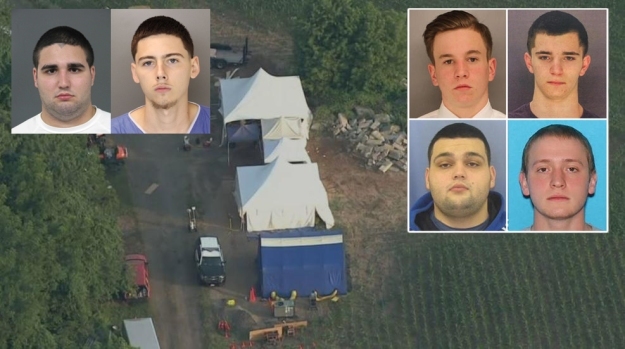 DiNardo and Kratz, described as cousins in the criminal affidavit, allegedly murdered the four men between July 5 and July 7 on the 70-acre DiNardo family farm in Solebury Township. Kratz is charged for three of the murders, while DiNardo faces charges for all four. At an arraignment Friday afternoon, both men entered not guilty pleas. Snow ordered that they be held in separate prisons out of concern for their safety. On Thursday, in what his attorney called a "full confession," DiNardo admitted to authorities that he'd been involved in killing all four men. Patrick was shot to death by DiNardo on July 5 as the two were alone on the farm, prosecutors charge. DiNardo told authorities that he and Patrick had arranged to meet on the farm for a marijuana drug deal, but once Patrick had arrived, DiNardo fatally shot him instead. He said he used a backhoe to dig the hole in which he buried Patrick's body. The other three victims were killed July 7 in two separate incidents at the farm, both of which were under the guise of a drug deal, according to the affidavit. Kratz and DiNardo had planned to rob Finocchiaro after luring him to the farm, but he was shot in the head by Kratz, the affidavit said. Later in the day, the two met up with Sturgis and Meo and shot them to death in a similarly sudden manner, the charging document said. After killing Finocchiaro, Sturgis and Meo, DiNardo and Kratz put their bodies into a large container — what DiNardo called a "pig roaster" — and burned them using gasoline, according to the affidavit. On Thursday, DiNardo's lawyer announced that his client had admitted to the killings and was cooperating with investigators. Kratz was arrested later the same day, authorities said. Cosmo DiNardo's cousin, Sean Kratz, confessed on Friday to taking part in the murder of multiple men in Bucks County. Jimi Patrick, the first to be killed, was the last body to be identified. NBC10's Deanna Durante has that part of the story. NBC10 journalists Deanna Durante, Rosemary Connors, Randy Gyllenhaal and Katy Zachry contributed to this report.